At Burnhamthorpe Dental in Etobicoke, we believe your smile is your greatest asset. We truly care about our patients and their oral health, placing their comfort and satisfaction above all else. At Burnhamthorpe Dental, Dr. Henry Nirenberg and his skilled dental team has served families in the Etobicoke community for over 40 years in cosmetic dentistry, preventive dentistry and overall oral health. He has grown his family dental practice to welcome patients of all ages including children, adults, and seniors with a focus on preventative dentistry. 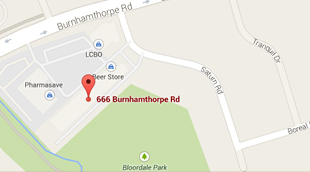 Burnhamthorpe Dental is located at 666 Burnhamthorpe Road inside Etobicoke's Burnhamthorpe Mall. Need a cosmetic and family dentist? We are currently accepting new patients and look forward to caring for your family.